Generally throughout wheat production areas at high elevations and in the northern and southern areas of temperate regions. Losses of 40 percent can be common with some fields totally destroyed. It is a major disease of fall seeded wheat in regions with cool nights or of spring wheat planted adjacent to infected fall seeded wheat. Severe losses result when spikes are infected. The small yellowish uredinia appear in linear rows on the leaf. A single infection can result in a stripe the length of the leaf. Uredinia also can occur in the spike. Stunting of plants is common with severe early infections. Infection occurs from 0 to 25 C, with free water on the leaf and may occur beneath the snow. During hot or dry periods sporulation ceases but will often restart with a return to cool moist conditions. Urediniospores are the single source of inoculum. Inoculum often comes from volunteer wheat plants and dormant infections that initiate or continue sporulation when conditions become favorable. Inoculum may move from nearby fields that were sown earlier or from later maturing fields. Free water on the leaves and temperatures of 0 to 25 C are required for spore germination. Penetration is through the stomata. The latent period may vary from 11 days with mean daily temperatures of 15 C, to perhaps 180 days with near freezing temperatures. Hot summers and dry seasons are most threatening to stripe rust survival. Survival between crop seasons is by dormant mycelium and uredinia on infected volunteer wheat in most areas. 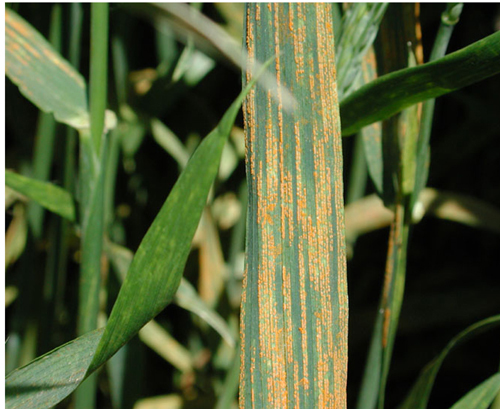 In mountainous tropical and subtropical areas stripe rust can survive by moving up and down the mountain on seeded wheat. Infected grasses probably play no role in survival in most of the world. Windblown urediniospores are the primary method of dispersal. Stripe rust urediniospores probably are less tolerant of environmental extremes then either leaf or stem rust of wheat. The disease was transported accidently by man into Australiain 1979, and barley stripe rust, a similar disease, into Columbia in 1975. Primarily a disease of wheat (Triticum sp.) and a few Hordeum vulgare cultivars worldwide. In Europe and South America a separate formae specialis attacks barley. Chen, X. M. 2005. Epidemiology and control of stripe rust [Puccinia striiformis f. sp. tritici] on wheat. Can. J. Plant Pathol. 27:314-337. Robbelen, G. and Sharp, E. L., 1978. Mode of inheritance, interaction and application of genes conditioning resistance to yellow rust. Adv. Plant Breeding, 9, 88 pp. Stubbs, R. W., 1985. Stripe rust. Pages 61-101 in: The Cereal Rusts Vol. II: Diseases, distribution, epidemiology and control, A. P. Roelfs and W. R. Bushnell eds., Academic Press, Orlando, Fl. Zadoks, J. C. and Bouwman, J. J., 1985. Epidemiology in Europe. Pages 329-369 in: The Cereal Rusts Volume II: Diseases, distribution, epidemiology and control, A. P. Roelfs and W. R. Bushnell eds., Academic Press, Orlando, Fl.